ASAHI YUKIZAI CORPORATION was established at Nobeoka in Miyazaki Prefecture, Japan, not very far from Takachiho, known as the place of the descent of Deity Amaterasu's grandson, in March 1945 before the end of World War II as a manufacturer of aircraft components. The components were made from wood, instead of metals which were then in short supply. Asahi AV Valve & Piping Systems Business, a segment dealing in valves, joints, pipes and others, created the world's first plastic valves based on rustproofness, chemical resistance, lightweight and other characteristics of plastics. Compact and Light. The BALL CHECK and BALL FOOT VALVES are so compact and light that they can be installed in a limited space. They are also easy to maintain, because of minimal internal parts. 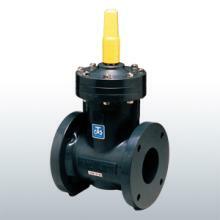 The SWING CHECK VALVE prevents backflow, thus protecting equipment, such as a pump. Being of an swing arm type, the valve gives little resistance to flow. The SWING CHECK VALVE is highly resistant to corrosive chemicals, acid and alkaline, because of its plastic construction. To maintain the SWING CHECK VALVE, only the bonnet lid has to be removed, without taking the body out of pipeline. All wet sections are made of corrosion-resistant material, thus preventing corrosion and turbid water due to rust, The GATE VALVE, made of high impact polyvinyl chloride, can be used for water supply and drainage. The channel surface free from irregularities allows for smooth flow. The rubber soft seal ensures excellent water tightness. Because of its plastic body, the sediment STRAINER (Y) is higly corrosion chemical and wear resistant. The body is transparent, so that flow through the STRAINER can easily be checked. The sediment STRAINER is easy to disassemble and reassemble to clean or replace its screen.